Photo received from Ian P. Wheeler (UK) showing his Grandfather who was the Rescue Manager of a colliery in Fife and Ian is trying to identify the car in which he and his crew are posing in. Our Tim Harding identified the vehicle as a cca 1902 Arrol-Johnson 12HP Dogcart. Arrol-Johnson were one of the first British car manufacturers making the Dogcart in 1895 in Camlachie, Glasgow, Scotland. 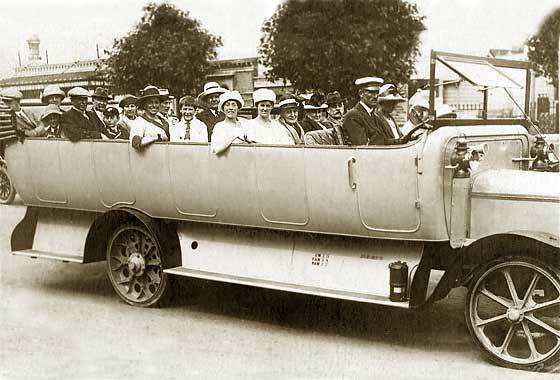 Name 'dogcart' comes from a light back-to-back seat carriage, that could have been pulled by a dog ! Lovely period photos received from Michael Rowland (UK). 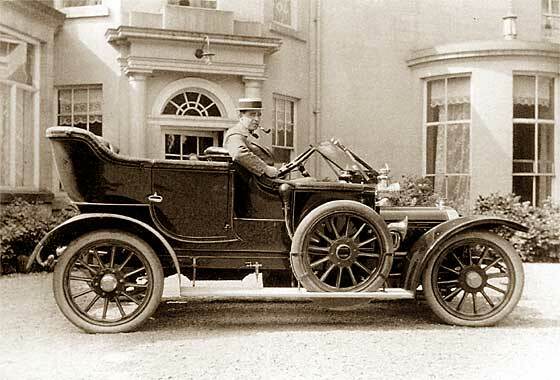 Our site has been recommended to him with the hope we can identify the car owned by his Grandfather, Arthur Percival Rowland (1875-1924), which would fill in a family history ‘blank’. 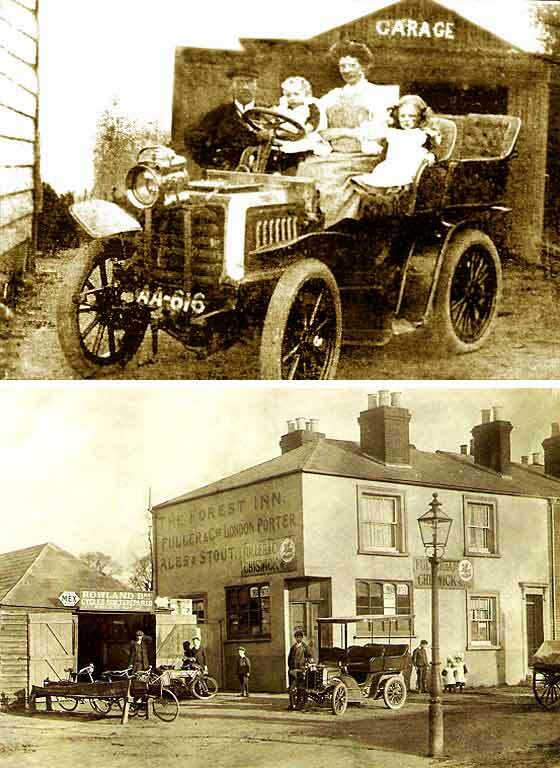 The car, the first in the village of Millbrook, nr Southampton, is a cca 1903 Darracq Tonneau. Registration is 1904 Southampton. Interesting snippet is that the motorcycle in background of the ‘Family’ photograph of cca 1912, is an unusual cca1906 Rex 3HP. IDENTIFICATION AND DATING: cca 1903 Buick Phaeton perhaps? Photo received from George Schneider, North Palm Beach, (USA) which was found in a box of old family shots. He has been trying to identify it. What is that odd flat coil between the front wheels? - The visible 'radiator' is a dummy and the lower 'coil' is the cooling radiator, common on earlier European cars. 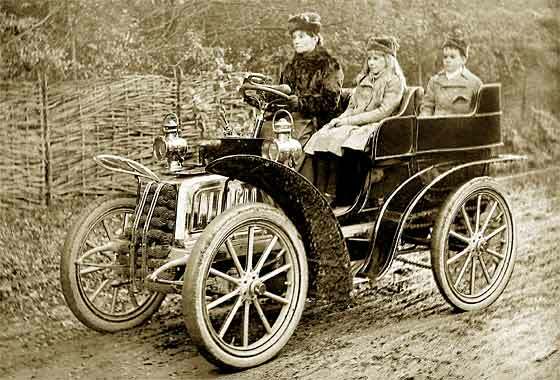 The car looks like a cca 1903 Buick Phaeton but I have some concerns about the bonnet line, the split coil, the front spring arrangement, and the Germanic 'tulip' body. Difficult! Interesting photo received from Frédéric Lefrac (France) advising of De Dion Bouton related photographs being offered for sale by auction. This photo was part of the flyer for the event. 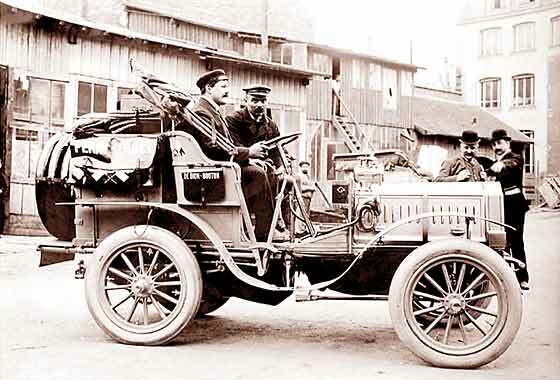 One of the photos shows Victor Collignon on Peking to Paris 1907 De Dion Bouton photographed at the factory in Puteaux. The original run was held in 1907 after an article in the French 'Le Matin' asking if anybody cound do it. 40 cars entered, only five took part. Won by Itala, with both De Dions finishing. 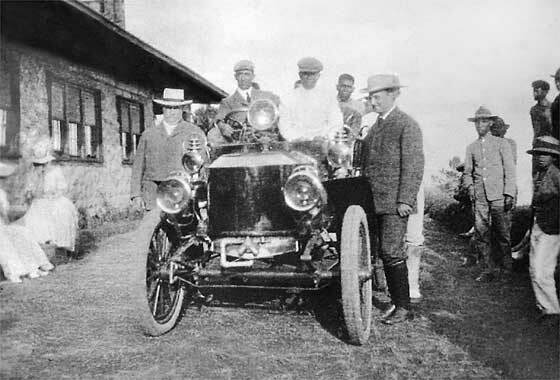 Photo received from Jaime F. Tiongson (Philippines) President of the Railways and Industrial Heritage Society of the Philippines obtained from the US Archives showing President William Howard Taft (Secretary of War at that time) and Governor General Cameron Forbes with a Stanley Steam Automobile. Picture was taken in Baguio when President Taft visited Philippines a year before he became president. This relates to our main article "Stanley Steamers in 1908 Philippines". Photo received from Bruno Costers (Belgium) of a Humber. Bruno has a website containing histories of a number of car manufacturers. This photo is interesting because it has been seriously retouched by hand at some time with a brush and the marks are quite evident. Upright bulkhead and windscreen, and flat mudguards, suggest that this car is a Beeston cca 1907/8 Humber Landaulette. Difficult to define the size in view that about 10 different model sizes were available, poss 20HP. Lovely period photo received from Michael Rowland (UK). Very brief email: " I would appreciate the ID on the attached car. 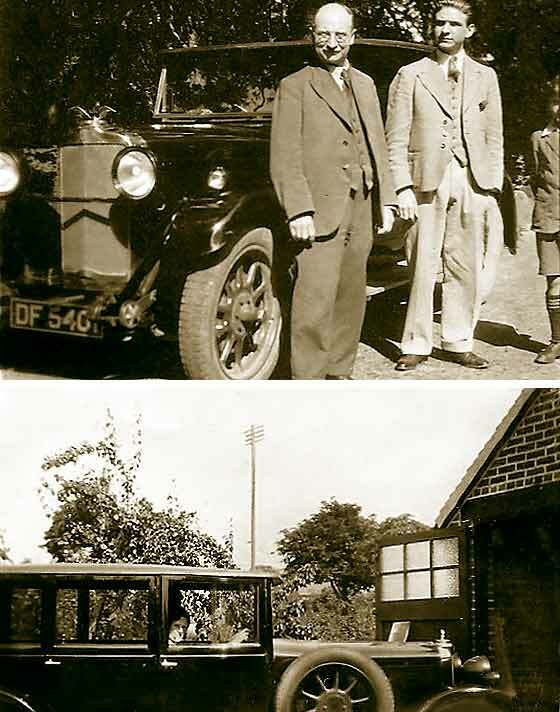 The driver and owner is my grandfather, Laurence Kitchin outside his house near Leeds. No other info I'm afraid. Thanks Richard Steel." We are pretty sure that this car is a cca 1910 Sunbeam Tourer. There were three models made during that year and we think it is probably the middle sized 16/20 model, 13'10" long, 5'9" wide, with a 4 cylinder 3.8L engine. Slight problem here. Photo received from Colin (New Zealand) saying it is of a Unic Taxi driven by his Grandfather. We think he could be wrong. Our Tim Harding confirms that: "This definitely is Napier 15HP Taxi of about 1911 operated by W&G Du Cros of Acton, whose W&G insignia can be seen on the door." W&G Du Cros definitely operated Napier taxis by the hundred. 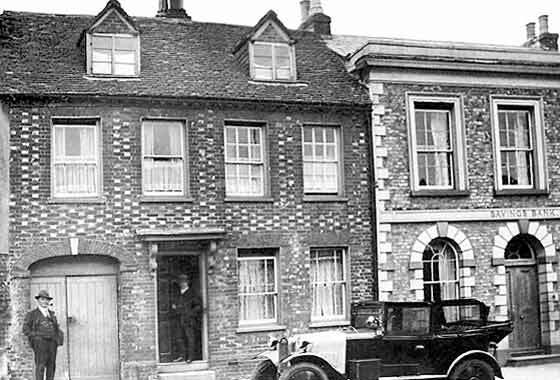 The number plate suggest Middlesex cca 1911. 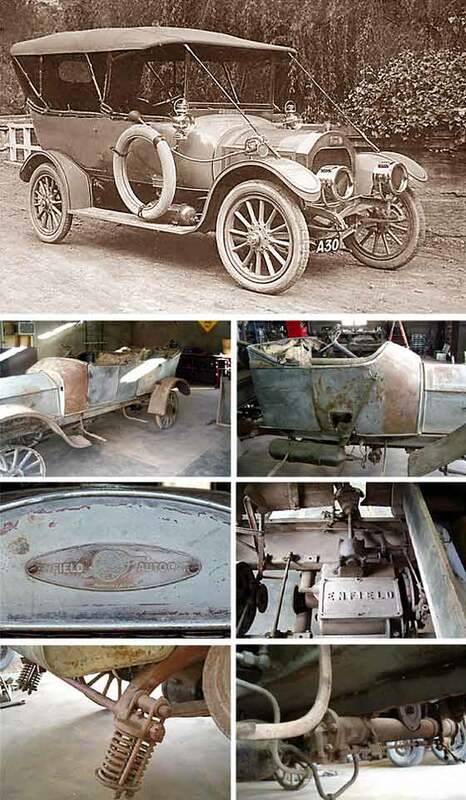 The famous Napier cars were made in adjoining Acton Vale from 1903. Photo received from David Handyside (Australia) advising that the remains of a cca 1913 Enfield Tourer have come to light. It was apparently delivered to the original owner in 1913 in Adelaide. Original picture also attached. Can we identify the model and would it sell in UK? - We have sent him specifications for models made during the 1913 so he can measure and investigate. If anybody in the UK is interested in a car requiring import and a fundamental rebuild, we will pass on details. 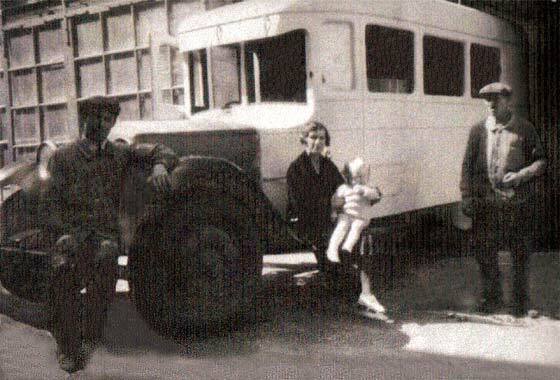 Photo from Charles Cook, Toronto (Canada) of his grandmother in an unknown charabanc possibly in London. She was born in 1869 and died in 1933. Identifying it would add more to his family history. - In view of the very ornate cast rear wheels, we are pretty sure this is a cca 1920 Daimler Charabanc but do not recognise the background so cannot confirm London location. 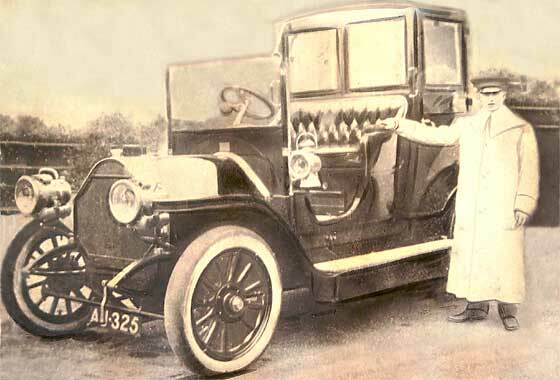 Many charabanc pictures have people showing, so front and radiator is missing, making identification hard. Photo received from Peter Robins (UK) found in his Grandfather's papers. Through the Redditch Advertiser discovered it was taken at Astwood Bank, and that the buildings are still there. 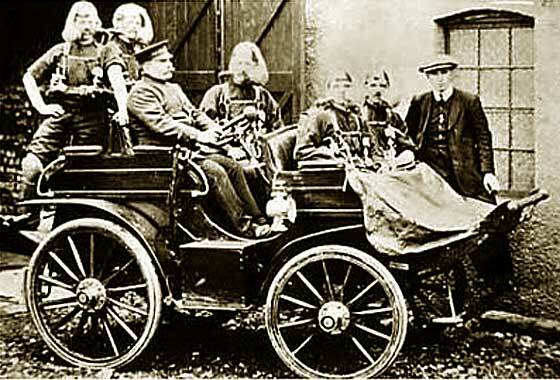 He thinks it was taken between 1910 to 1920, that the cars is Humber, and would like to identify people. Great Grandfather died in 1911 and Great Great Grandfather died in 1917. 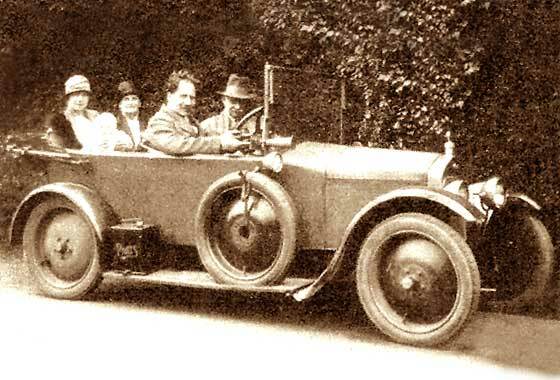 Sorry, cannot be either of those, - and the car is not a Humber, because it is a cca 1924 BSA Tourer, possibly a TB21S. 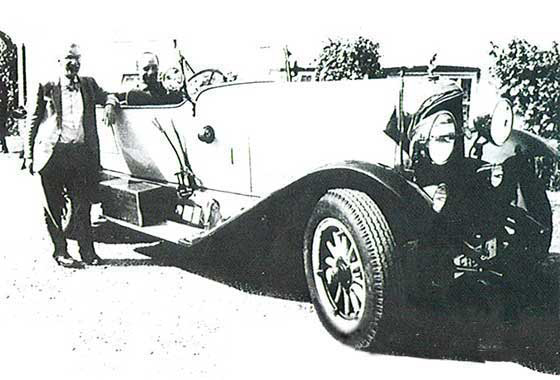 Photo received from Maureen Biri, email address suggesting (Australia), asking if we could identify the 1920's English car. Photo shows her grandfather driving his car in the English countryside. It was taken in 1928 and the baby is her brother. 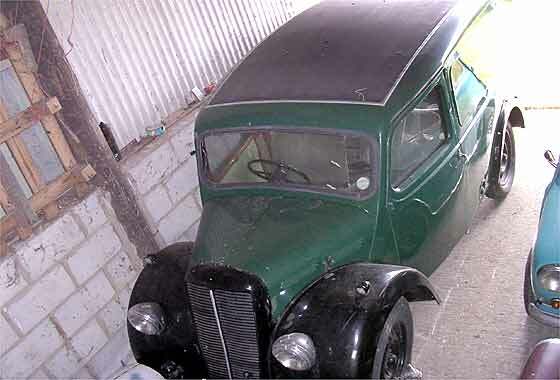 Could this be a Morris car as grandfather's subsequent cars were that make? Identity would be appreciated. Morris it is not, but it is a cca 1923 Wolseley Tourer. Morris purchased Wolseley in 1926, after they went badly bust for £2million. D F Oakley of Godalming (UK) Submitted this photo for identification to one of our favorite magazines, The Automobile. The photo was hanging in a west country hotel bar and nobody knew what it was. A Bentley perhaps? The car appeared to have UK numberplates. - The small sub-headlamps are typically Germanic and we advised the magazine that the car was a German cca 1924 Stoewer D12 Sports. 1991 pictures of the same car have it with wire wheels. Plates are German or Polish. Lovely period photo received from Lee Rhodes (UK) apparently found on the internet of his great grandfather, but with no other information. We can advise that this is a cca 1926 Star 20/25 Lorry manufactured in Wolverhampton. Confirmed by Star expert John Warburton as a model that was introduced in 1924 with a 90 x 120mm 4 cyl engine (3054ccs) and available either with solid tyres or pneumatics. Chassis price was £375 with pneumatics. Overhead worm drive rear axle. None exist now. Indistinct photo received from Jeanette Hillman (UK) of her mother in law Marcelle Hillman's cousin Ann Marie, - asking for identification. Everything about the photo makes life very difficult. It is an early 1930s body on a proprietary chassis. There appears to be no radiator cowl or core, and the rad seems to slope downwards and out toward the bottom. 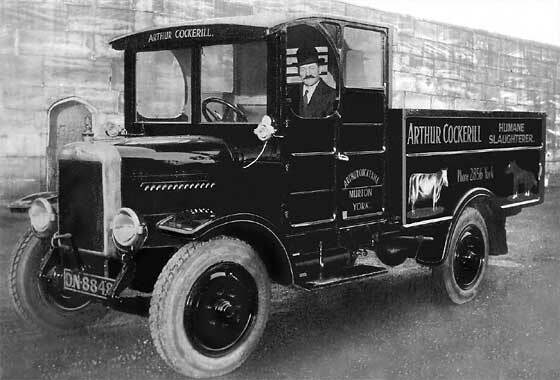 On limited evidence available, this is a cca 1929 Renault lorry with a later body often used as a local taxi / minibus by owner drivers. Couple of photos received from Paul Wallis, Hornchurch (UK) that were in the possession of his Aunt. The Gentleman in the forefront could be his Great Grandfather who lived in Cheltenham. Photo's were probably taken in the late 20's or early 30's. He would like to know the make of car and it would be interesting to know if the car still exists. The car is a cca 1928 Talbot 14'45 Saloon registered at Gloucester County Council. Search of current DVLA register suggest there is no trace of this car. Photo received from Warren Carmichael (USA) asking is we could identify the model years of the cars in the photos. It would greatly assist in determining which ancestor was buried at this funeral. 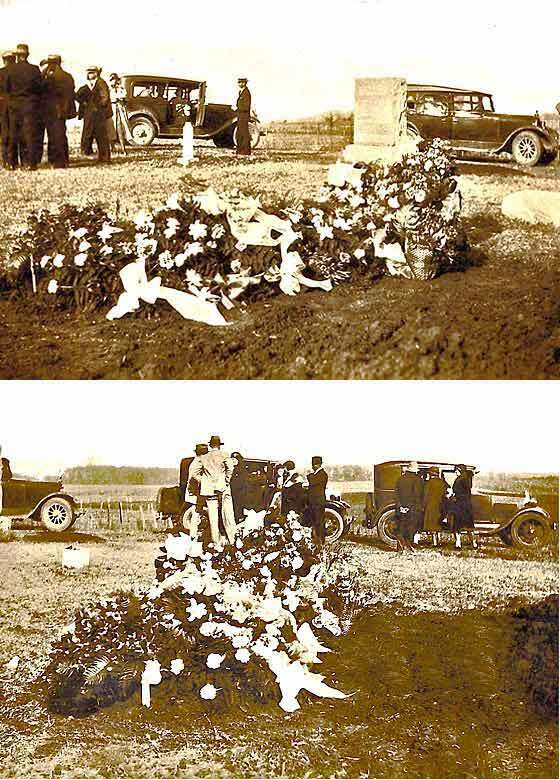 The two ancestors who may have been buried at this funeral died in 1922 and 1935. If any of the cars were made after 1922, then that would give the answer. Photos are low resolution but we think one of the cars is a cca 1924-8 Chevrolet with steel wheels. Therefore the funeral is likely 1935. Photo received from Claudio Luchina who is a modeler and who has just just discovered this car. He is looking for more pictures/ specifications (specially measures). We can advise that in 1930 Royal Mail introduced a fleet of blue Morris Minor vans to advertise the new Air Mail postal service. One special additional 'Streamline' van was designed by Maurice Lambert and was fitted to a standard 15cwt Morris Minor chassis. Also painted blue it was used generally for publicity purposes. Photo received from Nic Maennling from Ontario (Canada). 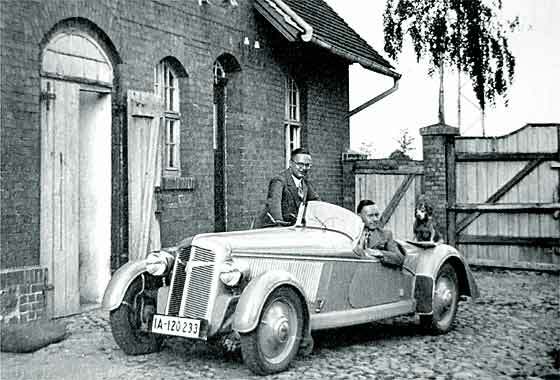 Pre-war photo taken in Germany of a car belonged to his cousin's grandfather. Would be most grateful if it could be identified. This is a rather nice German sports car, a cca 1935 Adler Trumpf Junior Sport. 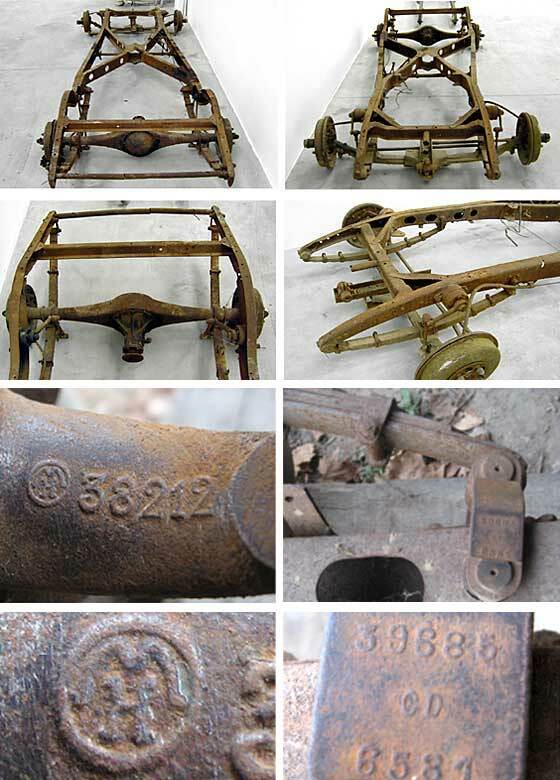 These were front wheel drive cars and part of a large family of Trumpf models lasting from 1932 to 1941. Trumpf Junior range sold over 100,000 cars. Photo received from Mark Boldry (UK) who has recently purchased a 1945 Morris 10 cwt van. He is struggling to find any information about this particular vehicle on the internet. He came across our website and was espefcially interested in the article on Ian Moreton's Morris 10cwt Martin-Walter conversion "Utilevan" . He has asked us to put him in touch with Ian. We believe Ian still has the van as he recently contacted us with further discovered information, which is in the article. Series of photos received from Marc Blaise (Spain) asking if we can help to identify maker of his chassis. He has noted different reference numbers on some parts and two letters "M" at the top and "H" at the bottom of the logo. The wheels have 5 nuts with a "G" and "D" so he thinks this could be a French car. Cable brakes and a braced cross chassis. Regretfully this is a little too specialised for us because only specific make experts would recognise the make from a bare chassis. 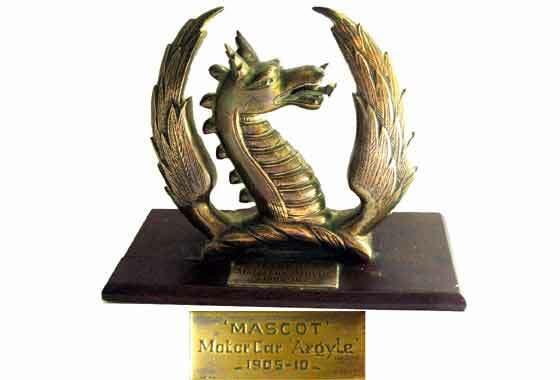 Photo received from Susie Green (UK) saying she has a a car mascot, which has an old plaque on it saying 'Mascot Motor Car Argyle 1905-10'. Do we know anything about this? The photo is very interesting, because there are three things that appear to be quite wrong with the mascot. 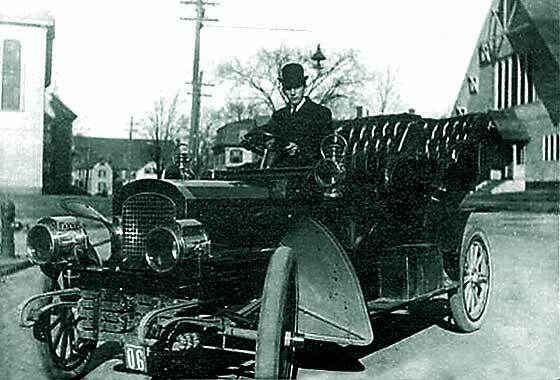 The Argyll car was spelled with a double 'll' and no 'e', the dragon faced the other way and the Argyll Motors Ltd were 1905 to 1909. In view of this, we regret we cannot add more to the mascot as photographed. Photo received from Tim Jones (UK) asking if we can help. 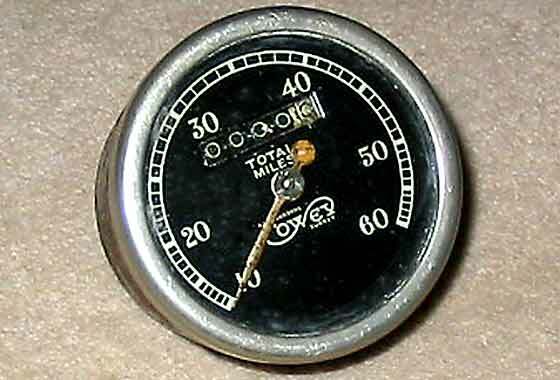 He is clearing out his loft and can across an old Cowey Speedometer. Can we provide any information on it, and on what cars it was used on? Cowey Engineering of Kew, Surrey were proprietary instrument manufacturers making vehicle speedometers, horns, clocks etc which could have been used on any vehicle. Coweys were also widely used on motorcycles and this could be one of those. Recent auction prices were around £200. Photo received from William Vaughn of Fairburn, Georgia (USA) asking if we could tell him please as to what vehicle and year model this is off of. 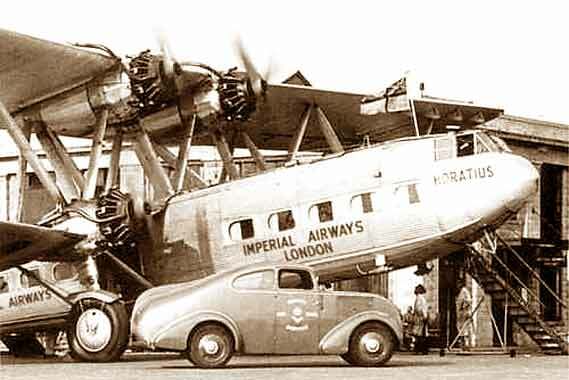 We here in the UK are not specialists on US cars but I recognise this as being probably from a cca 1936 Dodge. 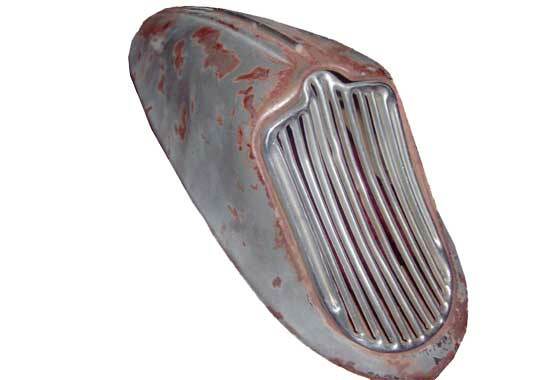 I think it is probably a horn grill. Dodge was Chrysler so same could be on other makes in the group. 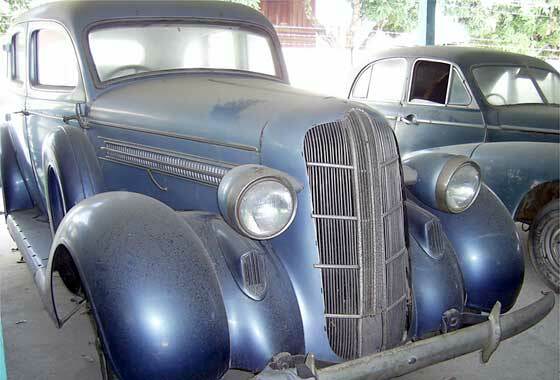 A picture of a Dodge with these same gizmos on, is on our Help Page 7 at: http://www.svvs.org/genpics6/1936_Dodge_4_door_Sedan.jpg.